Raising kids is tough. Ask any parent and they’ll talk to you for hours about the hundreds of daily decisions they face in naturing and nurturing their kids into healthy little human robots. Apple pie or chocolate pie? Stroller or back-buggy? Power Rangers or Power Puff girls? Blue or Pink? Christianity or Judaism or Islam? Recently I saw a T-shirt (at the Tokyo Motor show) encapsulating one of these timeless questions, complete with answer. I couldn’t believe my luck, so snapped a quick picture to share with you here. 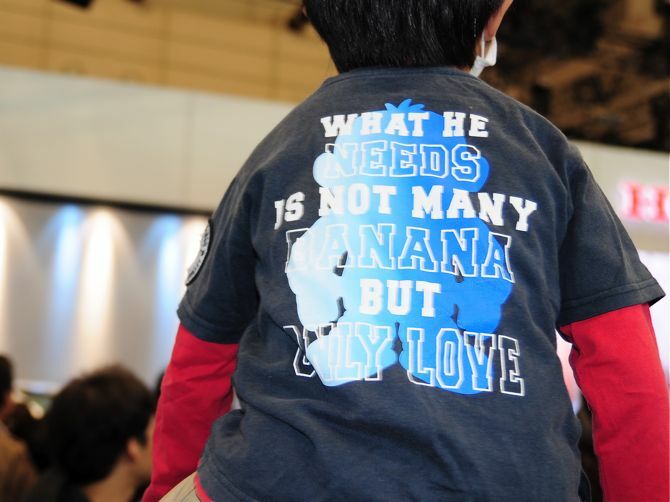 What he needs is not many banana but also love. So all you parents plying your kids with bananas, put them down. Only love will do. I feel this could be a great John Lennon lyric. To sum-up, this is Tokyo content. I swore off it for a while, but with the new site layout I feel it can be allowed back into the fold. No commitments about how much I’ll post, but if something stands out I’ll probably stick it up here. I think an occasional Japangrish article adds spice to the mix. Heaven knows how plentiful the material is here. I don’t know if it’s your blog or my clients (IE6, Opera 10? ), but clicking on links to comments takes me to the top of the appropriate article, but not to the specific comment as it used to. I think it is good advice.